My boss Dr. Alfred McEwen has given me permission to post the presentation on the Io Volcano Observer (IVO) mission concept he gave a few weeks ago at the Io Workshop in Berkeley, California. You can find the presentation here. The presentation covers mission design, mission goals, baseline and optional payloads, and risk assessment. The current mission design calls for a January 2015 launch (with a window from late 2014 to early 2015). IVO would be launched into a Venus-Earth-Earth gravity assist trajectory, similar to the interplanetary path taken by Galileo between 1989 and 1995. Calibration for IVO's various instruments would be performed during one of the Earth encounters, though McEwen does note that an asteroid encounter during one of the apohelions could be used as a dress rehersal for the Io flybys. After a six-year cruise, IVO would enter orbit around Jupiter in 2021. 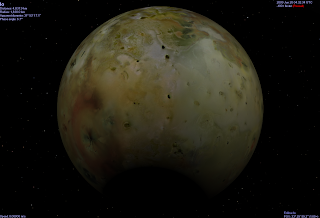 Prior to Jupiter orbit insertion, IVO would perform its first flyby of Io. While other information I have found suggested that no science would be acquired during this first encounter, McEwen presentation points out that the reason for performing this encounter is to acquire unique equatorial science since the encounter doesn't actually reduce the delta-V, like the inital Io flyby did for Galileo. IVO would be inserted into an inclined, 200-day-long initial orbit following JOI. During IVO's orbital tour, planned to last at least 1.5 years, the spacecraft would flyby Io at least six more times, with the goal of having more than ten flybys with the help of an extended mission. With the various sources I have, I am not certain if they plan to have six flybys during the primary mission with at least four more during an extended mission, or if the six-flyby number is only a baseline for mission success. The trajectory design calls for the Io flybys to also be used to "pump down" the spacecraft's apojove, eventually bringing IVO's orbital period down to 30 days. The first few flybys of Io would be further out, with altitudes between 500-1000 km, until estimates of Io's position are refined. Later encounters can then be brought down to altitudes approaching 100 km, supporting magnetometer and mass spectrometer science. Like Galileo, data would mostly be taken during the few days surrounding perijove and would be transmitted to Earth near apojove, though the much greater bandwidth with IVO would support more apojove science, such as imaging of Jupiter and eclipse observations of Io and Europa. Also, thanks to IVO's increased bandwidth, up to 20 Gb of data would be returned after every flyby, much greater than Galileo's entire Ionian dataset. I can't recall, but that maybe more data than Galileo returned during its entire Jovian tour. For planetary protection purposes (God forbid we contaminate poor Amalthea), the spacecraft would be impacted with Io at the end of its life. 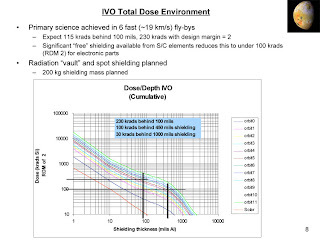 However, several end of mission scenarios have been developed, including one that would put IVO into very large orbits, with periods up to one-year in length, in order to monitor Io for up to a decade and to perform a lifespan test for the Advanced Stirling Radioisotope Generator (ASRG), the next-generation power source to be used by IVO. In another scenario, IVO's perijove would be raised to pull it out of the worst of Jupiter's radiation belts, again to extend the spacecraft's life, though there maybe issues with the requirement to dump IVO on Io at the end of the mission. Io Volcano Observer, being half a science mission and half a engineering test, has a very focused set of mission goals. As you can see in the slide at right, the primary objective of this study is to see if an Io mission can be accomplished with a Discovery budget, assuming NASA furnishes the ASRG and NEPA. IVO's planners also want to test out the ASRG for as long as possible, thus the desire to extend the lifespan of IVO as long as possible before crashing it into Io. In additions, measurements of the radiation environment will help planners of future missions to the Jovian system. There are also secondary goals to study the rest of Jovian system. Most of these observations would be acquired near apojove. These include: monitoring of Jovian clouds systems near the poles (complementing data from Juno), distant observations of the Galilean satellites including Europa's atmosphere, close-up observations of Jupiter's inner moons near perijove, and observations of Jupiter's rings and the Io Plasma Torus. Due to data volume restrictions on the later, shorter orbits, many of these observations would be acquired during the initial, 200-day orbit, when data volume would be more plentiful. At the Io workshop, McEwen presented details on the planned baseline payload as well as other instruments that could be used on IVO. With this payload, McEwen and his team hope to accomplish the science goals discussed above. The baseline payload for IVO includes the following instruments: a narrow-angle camera with an angular resolution similar to Galileo, a thermal mapper similar to THEMIS on Mars Odyssey, an Ion and Neutral Mass Spectrometer, and magnetometers. Other potential instruments outlined by McEwen include a wide-angle camera, a near-IR spectrometer, and an EUV/FUV spectrometer. The narrow-angle camera, as outlined by McEwen, would provide medium-resolution surface monitoring and high-resolution surface imaging during flybys, while keeping noise to a minimum. Unlike most spacecraft imagers in use, the camera would use a CMOS focal-plane system with both framing and pushbroom modes. The fast readout times for the CMOS system would help keep radiation noise down by reducing the amount of time between the image exposure and its storage in memory. The CMOS detector would be split up so that the bottom half of the detector (1000 lines by 2000 columns), would be used for clear filter, framing-mode imaging, similar to Cassini's ISS. Up to half of the detector would be used for color filter, pushbroom imaging, similar to the Mars Reconnaisance Orbiter's HiRISE camera. This upper section would consist of up to 15 color filter strips of 64 lines each. These strips would use digital Time-delay Integration to produce nearly simultaneous color imaging (necessary for lava temperature measurements), super-resolution, and faint-target imaging. At minimum, McEwen's group would like to include broadband UV, blue-green, red, and near-IR dTDI lines, though other filters could be included, mostly narrowband filters designed for spectroscopy. IVO's thermal mapper would be designed much like Mars Odyssey's THEMIS instrument. 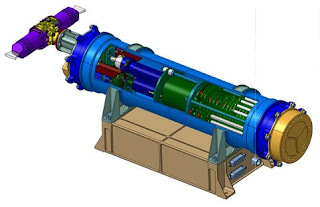 The instrument would include at least three bandpasses between 2 and 20 microns and would have a resolution about 12.5x coarser than the NAC (assuming new detectors are used, compared to THEMIS). With Thermal Mapper, IVO planners hope to map and monitor Io's thermal emission, perform thermal emission spectroscopy, and analyze Io's polar thermal emission and compare it with results from Galileo at low latitudes. For a baseline mission, the expected bandpasses would be at 2, 5, and 20 microns, though more bandpasses maybe possible. Some that interest IVO planners occur between 7 and 9.5 microns, wavelengths diagnostic for silicate mineralogy. The Ion and Neutral Mass Spectromter (NMS) was covered recently in a blog post, so check that out for details of that instrument. IVO planners seem confident that they can detect most of the expected species in Io's atmosphere (like SO2, SO, O, and NaCl) thanks to its high signal-to-noise ratio and 1-300 amu mass range. These instruments would be bolted to the top deck of the spacecraft, below the High-gain antenna. This would force decisions between having a gravity pass and a remote-sensing pass, much like Cassini. Much of the electronics for these instruments would be stored below this top deck, in a radiation-shielded "vault", in hopes to reduce the chances for radiation affecting measurements. A major limiting factor for the lifespan of IVO is the high charged particle environment near Io. Even with the high-inclination orbits, IVO planners expect betwen 115 and 230 krads, though the spacecraft electronics may have a much reduced exposure during the primary mission. Another issue is the current projected price tag. A JPL Team X assessment in November came up with a cost $471 million. I'm not sure if that is for the baseline mission, but at least $21 million will need to be trimmed from the estimated budget to get IVO within the Discovery costcap. 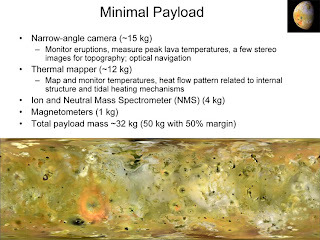 This presentation lays out a pretty compelling case for a cost-effective mission to Io. As of earlier this month, IVO planners were preparing to finish their final report for the DSMCE program and were looking forward to submitting this proposal for the next Discovery Announcement of Opportunity coming (hopefully) sometime around mid-year. Next year is the season of eclipses in the outer solar system. Both Jupiter and Saturn will both see the beginning of northern spring next summer. Equinox at both planets also means mutual event season. Astronomers use this time to observe occultations of two moons, when one moon appears to pass in front of another (see this example from Cassini, when Rhea passed in front of Enceladus). Mutual event season is also a season of shadows, when the shadows of the giant planets' moons cause eclipses on other moons or the rings. At Io, the scientifically most useful type of mutual event have been occultations. By monitoring the brightness of Io as another moon occults it, an astronomer can determine the location of hotspots on the surface by measuring the time when bright IR sources are occulted then later reappear. Robert Howell measured quite a few of these occultations during prior mutual event seasons in 1996-1997 and 2003. 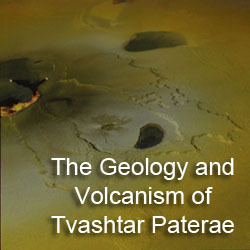 See his LPSC abstract from 2003 for an overview. Using these occultations, Howell could not only determine whether or not Loki was active, for example, but also which part of its patera was hot. Recent developments in adaptive optics technology have greatly improved the spatial resolution of ground-based observations, seemingly reducing the need for making such measurements now that they rival them in resolution. However, these adaptive optics observations are only performed at a few of the largest telescopes in the world, like Keck and ESO, which may observe at best a few nights out of the year. Occultation measurments can be acquired by much smaller telescopes equipped with a high-speed, infrared photometer. 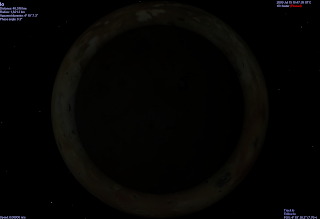 In addition to equinoxes, Io will experience eclipses of the Sun by two other Galilean satellites: Ganymede and Callisto. All but two of the total eclipses seen from Io will be by Ganymede. Ganymede eclipses occur a week, beginning on June 9 and ending on August 5. The early eclipses are best seen in the north polar region, while the later eclipses are best seen over the south polar region. The eclipse covering the most terrain on Io will be the total solar eclipse by Ganymede on July 15, 2009 at 10:47 UTC. The total solar eclipse will be visible across much of Io's sub-Jupiter hemisphere between 48 North and South latitude, and 232-52 West longitude. The polar regions will experience a partial eclipse. During the eclipse, Ganymede will appear 13' 17.2'' across in the sky (compared to our moon, which appears around 30' across in Earth's sky). The sun will appear 6' 19.9". Therefore, it is unlikely that the sun's corona would be seen during the eclipse except near the beginning and end. At its peak, the eclipse will last 1 minute and 55 seconds long. 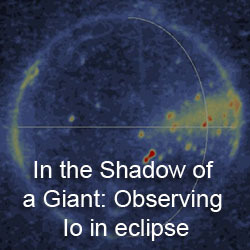 The only total solar eclipses by Callisto visible from Io will both occur on June 20, 2009. These eclipses will primarily be visible in the south polar region of Io, on the trailing hemisphere side. The first eclipse occurs at 04:32 UTC, while the second occurs at 09:01 UTC. A third total eclipse would be visible on June 3, however totality starts after a Jovian eclipse has started. June will also see two, multiple Ganymede eclipse days, with two eclipses on June 9 and three on June 16. 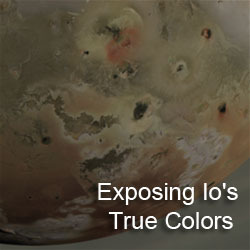 Okay, it has been a while since I have discussed the Io Volcano Observer (IVO). This mission concept was developed in response to the Discovery and Scout Mission Capability Extension (DSMCE, pronounced DOS-MICE). The DSMCE program was started by NASA to examine the viability of Discovery-class mission powered by next-generation radioisotope power generators provided to the PIs at no cost to the mission. The IVO study is headed by Alfred McEwen at the University of Arizona with scientists and engineers at Ball Aerospace, USGS-Flagstaff, JPL, and the University of Bern in Switzerland. Check out my previous posts on IVO, particularly those from LPLC after a talk by Dr. McEwen, and one based on the conference abstract. Well, obviously, despite the fact that the initial study is finished, very little has shown up on the web. There is a good reason for that. There is a very good chance that McEwen et al. will submit a proposal for the mission with the Discovery Announcement of Opportunity is released next year (April 2009?). Despite this, I have found a new online source for information on the mission, particularly on the Ion and Neutral Gas Mass Spectrometer (INMS) from a presentation given by the Peter Wurz of the University of Bern in October. 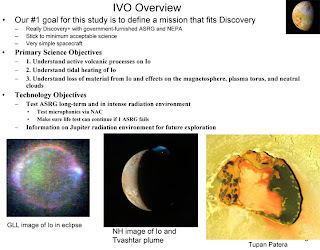 The presentation's fifth slide provides an overview of the IVO mission, mostly with details that were previously known. Three instruments are planned for IVO's payload: a narrow-angle camera, a thermal infrared imager, and an ion and neutral mass spectrometer. A Radiation Detector and Ultraviolet Spectometer are not mentioned, like in Dr. McEwen's presentation in May. The baseline mission plan remains much the same as was outlined by Dr. McEwen: a launch planned for 2013 (with a backup in 2014), Jupiter orbit insertion in 2020 with the first Io flyby in June 2020 (a year later than the baseline mission presented in May), and a science phase that runs 16 months to October 2021. 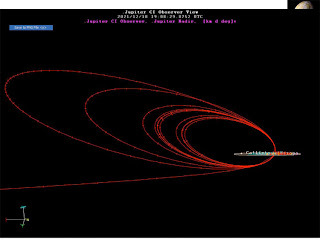 Considering that the initial Jovian orbit following the first Io flyby is expected to run on the order of 200 days, the other nine flybys are planned between December 2020 and October 2021 occurring on the order of about once a month. Dr. McEwen's presentation at LPSC went into a bit of detail of the Narrow-angle camera and the thermal imager, but he ran out of time before he could get to the INMS. Therefore, the presentation by Wurz is complementary to McEwen's. IVO's INMS is a time-of-flight mass spectrometer with some design heritage with the ROSINA instrument on Rosetta. P-BACE, a spectrometer similar to the one planned for IVO, was developed at Bern and was aboard MEAP, a stratospheric balloon mission that recorded measurements of the circumpolar wind patterns between Sweden and Canada. Based on the measurements acquired by P-BACE, Wurz and Thomas expect to be able to measure most of the atmospheric species expected at Io, such as sulfur dioxide, sulfur, hydrogen sulfide, sodium, potassium, and oxygen. The scientific goals for IVO's mass spectrometer include: measurements of Io's atmospheric scale height and major components; a search for differences in these measurements as a result of temporal changes, geography, or day-night cycles; measurement of atmospheric loss mechanisms and rates (due to sputtering for example); and measurements from within a volcanic plume. Overall, the INMS looks like an interesting addition to the mission. The instrument could also take on increased importance as a similar instrument may not make it on the Europa Orbiter since the instrument would push the cost of the EO above that project's budgetary "sweet spot." So even if Europa Orbiter is selected as the next Outer Planets flagship mission, IVO might still get proposed because of unique measurments a mass spectrometer could make. IVO could also provide a useful stopgap between New Horizons and EO (planned to arrive in the late 2020s).